The Outside Xbox host on why Empire's opening clash is a classic. 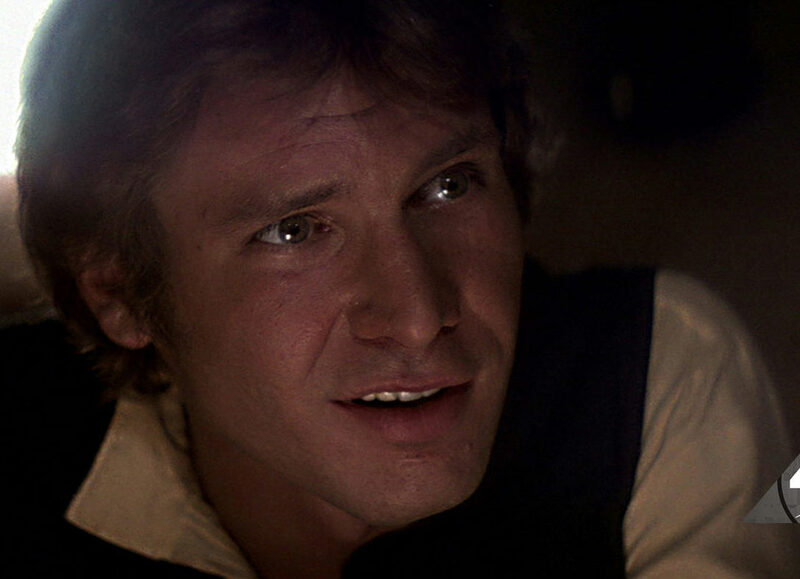 In My Favorite Scene, StarWars.com invites special guest writers to discuss which one scene or moment in the saga most resonates with them. 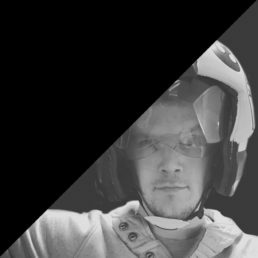 Mike Channell is co-editor at Outside Xbox, a thoroughly British YouTube channel about videogames. He’s also an irredeemable motorsport bore and, despite zero evidence of Force powers, reckons he would have made a rather good podracer pilot if he’d lived in a galaxy far, far away. As with most kids, even us British ones, all the Star Wars movies became like sacred religious texts to me, learned and recited over and over. But The Empire Strikes Back was the VHS in particular that got the most wear during my early, formative years. That’s at least partly because of the sequence set on the sixth planet in the Hoth system, confusingly also called Hoth. It’s the New York, New York of the Star Wars galaxy. I love the whole setup at the beginning of Empire. After the fist-pumping joy of the Death Star’s destruction and the almost unqualified happy ending that is the medal ceremony at the end of A New Hope (Biggs and Porkins, never forget), Episode V begins with a distinctly non-triumphant Rebellion cowering in the ersatz, warren-like Echo Base on the most inhospitable planet imaginable. How’s that for a gear change? 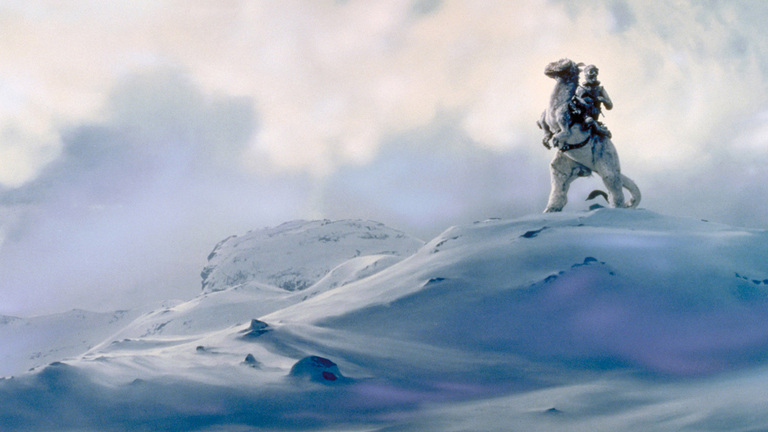 More specifically though, because them’s the rules, my favorite scene is the Battle of Hoth, which kicks off less than half an hour into the movie. It’s completely the wrong way around: surely you’re supposed to leave your most spectacular battle until the final third? That said, you’re also not supposed to follow up your wildly successful sci-fi movie with two hours of your beloved heroes getting emotionally and physically pummelled. 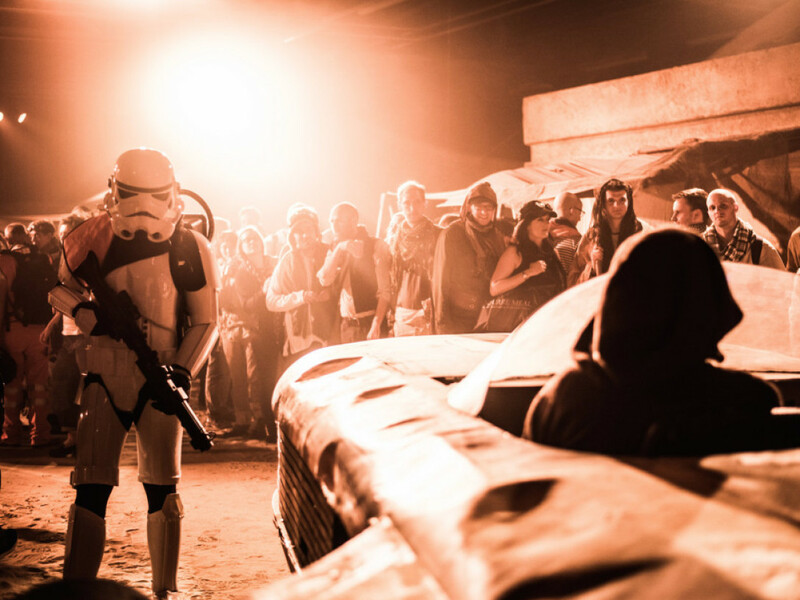 George Lucas didn’t stick to the rules and, as we all know, Empire is all the better for it. 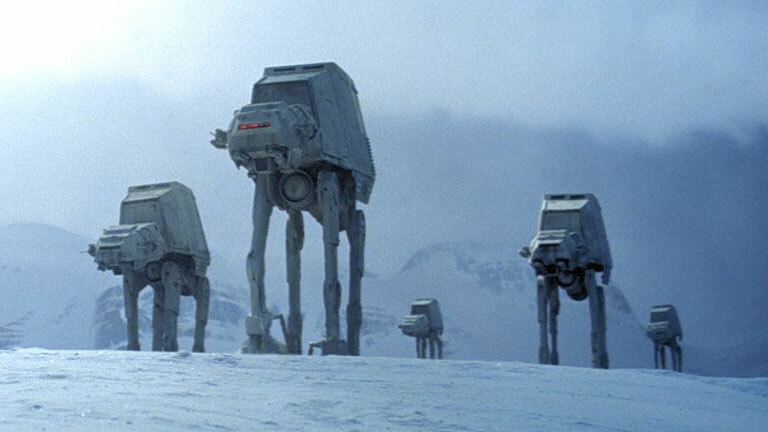 If I was forced at blasterpoint to narrow it down further, to a single, work-of-genius moment it would be the reveal of the Imperial walkers. A moment that spawned close to four decades of argument over whether it’s pronounced AT-AT or AT-AT. For the record, it’s AT-AT. Obviously. Go and watch the moment again (as if you need an excuse). It is just perfection. We first see the walkers as unidentifiable specs on the horizon. Then we view them from the perspective of an unnamed rebel soldier, through his pair of electrobinoculars. At first all we can see is a single, massive trash-can-lid foot, then the shot pans slowly up a leg that seems to go on forever before settling on the main chassis. These things, it is made clear, are colossal. Then as the final kicker, the shot zooms out, to reveal three of them plodding inexorably across the tundra towards the suddenly ramshackle-looking rebel forces. I cannot think of a better way to reveal one of Star Wars‘ most iconic vehicles. For me, one of the key appeals of science fiction is the ability to conjure impossible scale. In space, it’s all about the staggering enormity of a Super Star Destroyer, but on the ground, among ground troops, the Imperial walker is dauntingly huge. I rather fancy the Empire deploys them not because they’re particularly capable, but because they’re utterly terrifying as they slowly but surely advance towards you. 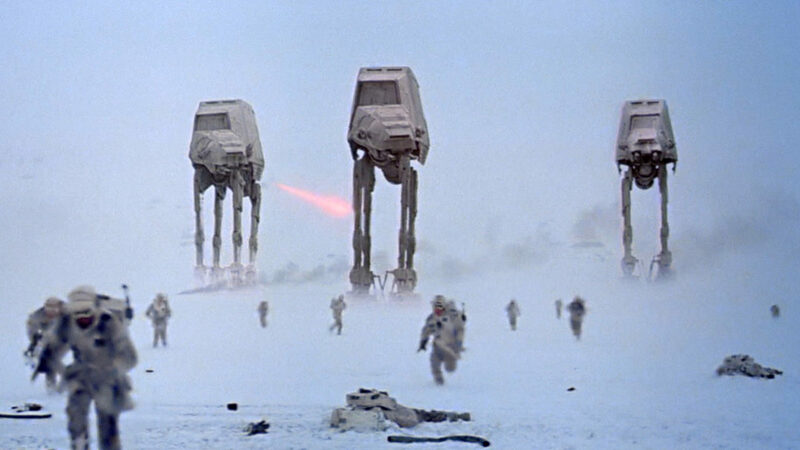 The AT-AT is the unstoppable force that has you scrabbling around looking for a nearby immovable object. What follows on from that masterful reveal is a fantastically exhilarating battle against five of the towering walkers. As with so many iconic moments in the Star Wars saga, the Rebellion are on the back foot and forced to improvise with that classic combination of inferior equipment and superior guts. All the other kids loved the X-wings or dreamed of piloting the Millennium Falcon but, like some sort of miniature hipster, from the very start my favourite Star Wars craft was always the snowspeeder. I loved how nippy and manoeuvrable they were, designed for skimming low and fast above the ground like a stone skipping across a lake. 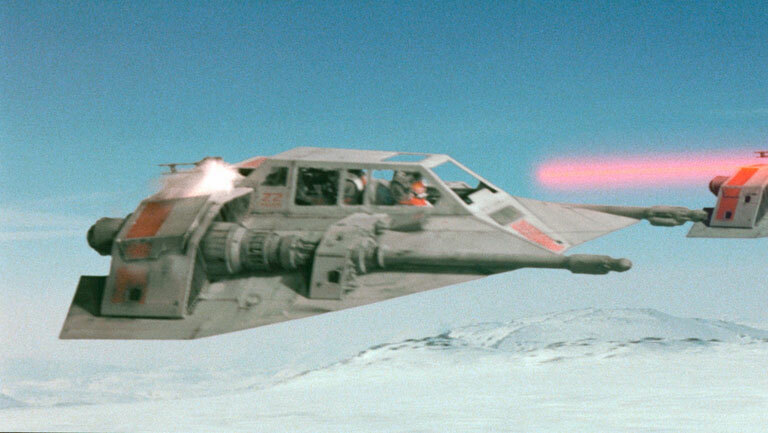 I loved the air brakes popping out as the speeders adjusted their attitude, the flying-wing wedge shape with two laser cannons poking out and the claustrophobic cockpit for two. I love how they swoop and dive between the legs of the advancing AT-ATs and the hard banked turns required to successfully hog-tie the enemy. I also love that to this day I have absolutely no idea what they would ordinarily be dragging around with that harpoon tow cable. It’s easy to forget that this breakneck sequence, played out against similarly crisp blue skies, was a whole six years before Top Gun‘s aerial dogfights. I’ve read that George Lucas decided a battle on a brightly lit ice planet was necessary because it was easier to “cheat” with your special effects in a space battle against a black background. 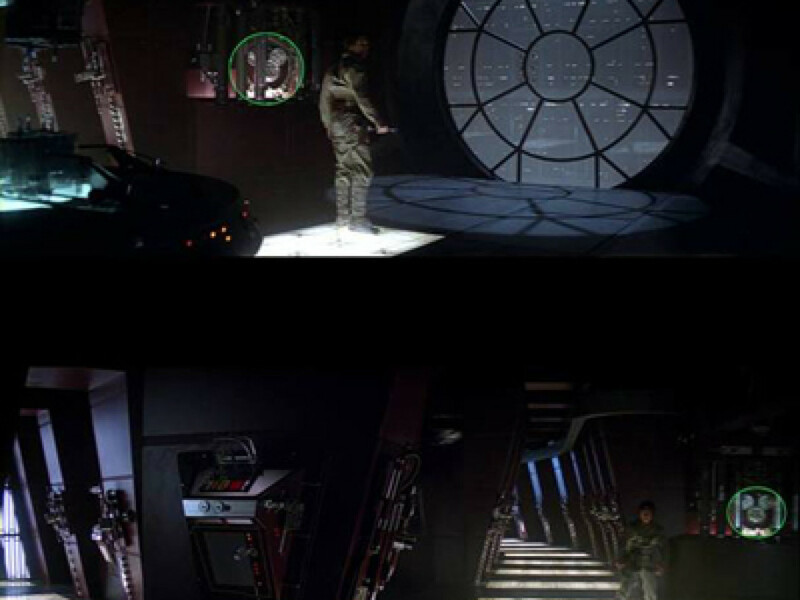 There was certainly nowhere for the ILM effects team to hide, but the effects were all the more convincing because of it. It’s a battle so spectacular, in fact, that even a Star Destroyer getting thumped by an ion cannon and listing dramatically in Hoth’s gravitational pull is somehow just a minor appetiser before the main action kicks off. Doing what I do for a living, which is making excitable noises about videogames on YouTube, Star Wars and gaming have been intertwined for my entire life, via titles like Dark Forces, Jedi Knight, and Rogue Squadron. 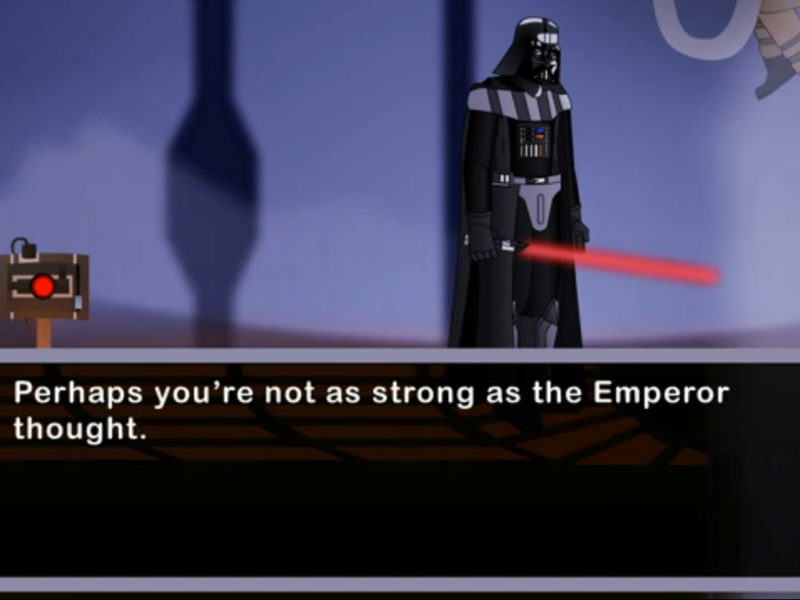 Still, I had to wait years for a game that accurately represented my favourite Star Wars scene in interactive form. I’d venture the first game to really do it justice was Shadows of the Empire on Nintendo 64. I’m sure there were other levels in that game after the opening Battle of Hoth mission, but I’m not convinced I ever actually played them. 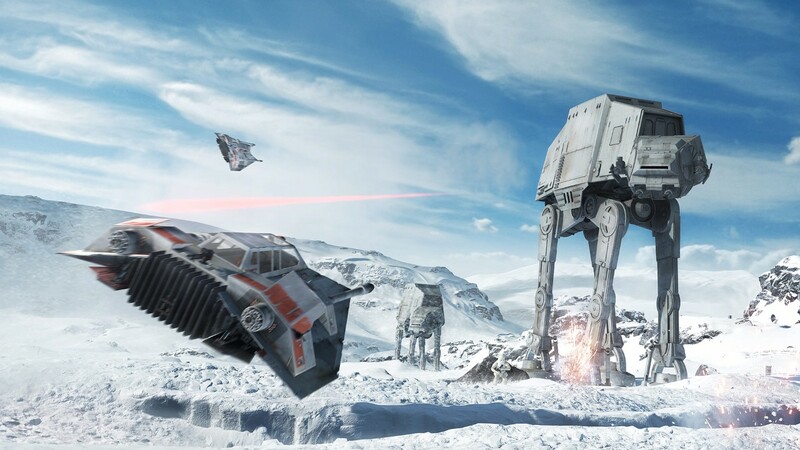 Of course, now with the most recent Star Wars Battlefront game you can participate in a full scale, entirely convincing recreation of the Battle of Hoth. If I traveled back in time and showed that to eight-year-old me, it would blow his tiny mind. And probably cause some dreadful, universe-destroying paradox as well, now that I think about it. While we’re here, let’s take a moment to pay tribute to Dak Ralter as well. A rebel rear gunner who’s so noble, so enthusiastic, so downright keen to make a difference for the Rebellion that the cruelest movie in the Star Wars saga has to kill him mere moments after he’s introduced, just to teach him a lesson. 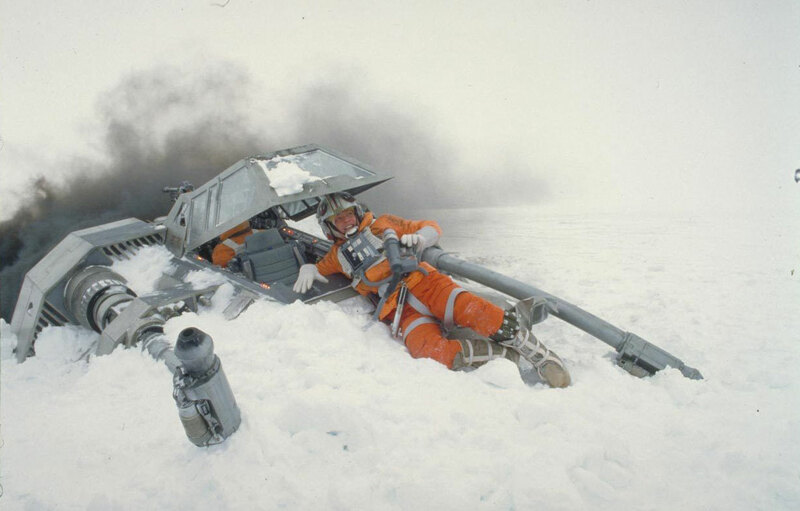 By all rights, hopping into Luke’s snowspeeder should have enveloped him in some sort of protective aura, but within minutes of exclaiming that he feels like he could take on the whole Empire himself, what he actually takes is a round of AT-AT laser fire directly to his angelic, optimistic face. Luke manages to maintain laudable focus throughout the battle as Dak’s head lolls distractingly around in the back like a carnation on a broken stem. But even the Force-adept farm boy can’t avoid the Imperial laser blasts forever and ends up ditching his snowspeeder right in the path of a clanking, lumbering AT-AT. It’s a real tone setter: welcome to Empire Strikes Back, kid, prepare for pain.